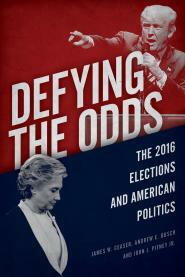 In Defying the Odds, we discuss attacks on Hillary Clinton. Saul Alinsky: "Pick the target, freeze it, personalize it, polarize it. Don’t try to attack abstract corporations or bureaucracies. Identify a responsible individual. Ignore attempts to shift or spread the blame." Richard M. Nixon: "Politics is battle, and the best way to fire up your troops is to rally them against a visible opponent on the other side of the field. If a loyal supporter will fight hard for you, he will fight twice as hard against your enemies." Hillary Clinton hasn't hit the campaign trail yet on behalf of Democrats running in 2018, but that isn't stopping Republicans from using the former 2016 Democratic presidential nominee as a reliable campaign boogeyman. In Pennsylvania's special election earlier this month, a super PAC aligned with House Speaker Paul Ryan handed out door-hangers that featured Clinton and Nancy Pelosi to attack Democrat Conor Lamb. And over the past two weeks, Republicans have tried to tie vulnerable Democratic senators to comments Clinton made at a recent event in India that were seen as a knock at more conservative areas of the country, in which she said she "won the places that are optimistic, diverse, dynamic, moving forward." President Donald Trump, she said, ran a backward-looking campaign. The National Republican Senatorial Committee has cut digital ads featuring Clinton's comments that target 10 Democratic senators running for reelection in states Trump won in 2016. The Republican challenger to one of those Democrats, Missouri Sen. Claire McCaskill, has also released digital ads tying McCaskill to Clinton and her comments.